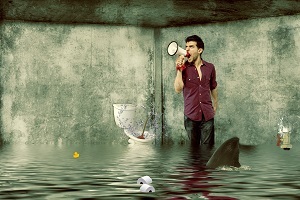 Dealing with a flooded basement is one of the most stressful and expensive experiences you can have as a homeowner. On average, it cost several thousand dollars to repair, with large homes costing over $10,000 in damages. The best defense to a flooded basement is a good offense, like performing planned preventative maintenance. When our team is part of process, we look for time and money saving opportunities that do not sacrifice quality. There are several measures you can take to protect your home and your finances from future flood damage. The City of Ottawa offers a number of initiatives through the Residential Protective Plumbing Program and additional residential grants. These funds are meant to help homeowners afford the repairs to keep their plumbing systems robust. Well-functioning home sewer systems ultimately protect the city sewer’s health. This is a unidirectional valve fixed onto the connection between your home plumbing pipes and the city sewer line. It prevents sewer water from backing up into your home in times of flooding and heavy rainfall. It is best if this valve is installed by a licensed plumber, like Dr. Pipe Drain and Plumbing Services . We can inspect, install, or replace the backwater valve on your property. All our work meets city code standards, and the requirements for Ottawa’s plumbing programs and financial grants. The subsidy for proper installation of a backwater valve is 80% of the cost, up to $1250. During heavy rains and storms, your basement may retain water very quickly. The water that would have collected in your basement is sent to a sump basin located under the basement floor. When the sump pump turns on, the water is transferred to a location away from the home. Back-up power may be used for the pump, just in case electricity is disrupted during operation. The city of Ottawa is offering a subsidy of up to$1750, to cover up to 80% of the costs. Weeping tile is a network of pipes around perimeter of the home, designed to drain groundwater away from your foundation. Each of these pipes has small holes for water to flow into. The water is then drained into an appropriate location, like the sump basin attached to the sump pump, or other area away from the house. As a preventative measure against flooding, we can sever or cap the connections between your weeping tile and storm sewer. The City of Ottawa has a subsidy that covers up to 80% of this cost, to a maximum of $400. After suffering from severe flood damage in the past, the City of Ottawa attempting a proactive approach. It is allocating funds to correct plumbing issues before more flooding occurs. Using these Ottawa programs can save you thousands of dollars per residence to ease the financial burden of preventative maintenance. Apply for the subsidy. You can find parts 1 and 2 of the application here and here, respectively. Forms can also be obtained from your local City of Ottawa Client Service Center. Apply for the relevant building permits. Certain plumbing work requires permits from the City of Ottawa. If you’re not sure whether you need a permit, call us and let us perform a free, no-obligation inspection. We can offer a clear and comprehensive explanation of what you need, including permits, to get the job done. Where applicable, complete a consent to enter form. This form gives official city employees permission to enter your home for inspection purposes. It’s important to note that the program requires work to be performed by a licensed plumbing contractor. You may find more information on the program here. Choosing Dr. Pipe Drain and Plumbing Services as your certified plumbing expert means having the support to make the application process stress free. You also have the expertise to get you the maximum flooding rebate for which you qualify. This is on top of the best quality plumbing and customer service in Ottawa. Our customers agree; check out their testimonials. These rebates are on a first-come, first-serve basis, and are not guaranteed to be available in the future. Give us a call; let us perform a no-cost, no-obligation inspection for you. Then we can create a plan of how best to use the City of Ottawa’s plumbing programs to make your home better.